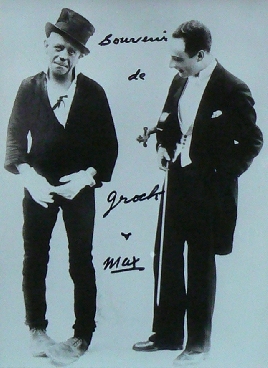 The stage artist and violinist Max van Embden became "famous" as the partner of the legendary clown Grock. He took part in the development of the world famous stage number - which originally came into being by Grock and his first partner Géo Lolé - and had a hand in the success. It was not an easy life as a stage partner of Grock, this also applies to Max van Embden. Grock looked at himself as the center of the number, his partners were covertible and lead a shadowy existence at his side. But Max van Embden was able to handle this egocentric character and worked together with the great clown for several years. Nevertheless they also separated time and again but came together again in the next decades. During the breakup Grock engaged other assistents. Max van Embden met Grock in 1915 in London and was engaged by him. The tours through Great Britain were very successful and Grock composed many songs for the stage tour together with Max van Embden. Later they also toured within Continental Europe, among others in France and from 1920 also in the USA. A first break-up of their partnership happened in 1924 as Max was refused a pay increase. They worked together from 1927 and were successful in the next years. Finally her stage number was filmed under the simple title "Grock" (1930). After anew argument about the salary they separated again and Grock engaged Geo Lolé with whom he already worked together in former years. Max van Embden and Grock are working together in the 40s and went on tour where they experienced the last great successes of this popular duo. Today Max van Embden is considered to be the most important partner of Grock and his name went down into history.